A sweet, bright flurry of colorful fresh plants celebrates vivid memories and expresses heartfelt sympathy to friends and loved ones. 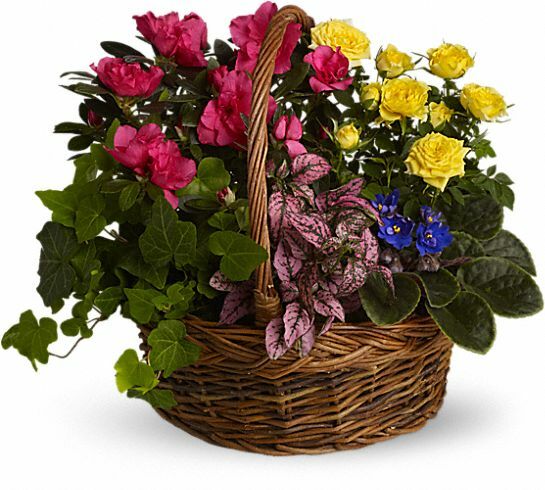 Delivered in a natural basket with a handle, so it's easy to move and place around the house. We didnt get the chance to attend but my cousin sent us a picture. Looked good to us! You won't be dissapointed. We surely weren't! We had them delivered straight to the funeral home. They had 'em waiting when we arrived. Easy! A truly beautiful arrangement of flowers. The colors just pop on this! Wow! I wish I could have ordered on for ourselves! so cheerful! Easy ordering and the same day delivery is an AMAZING feature. Thank you!! So happy with our basket! thank you! !